To open a used car dealership in California, you will need to apply for a license at the state Department of Motor Vehicles. To obtain your license, you will need to fulfill several licensing requirements. For example, you will need to pass both an educational course as well as an examination prior to submitting your application. You will also need to submit a California used car dealer bond as part of the process. 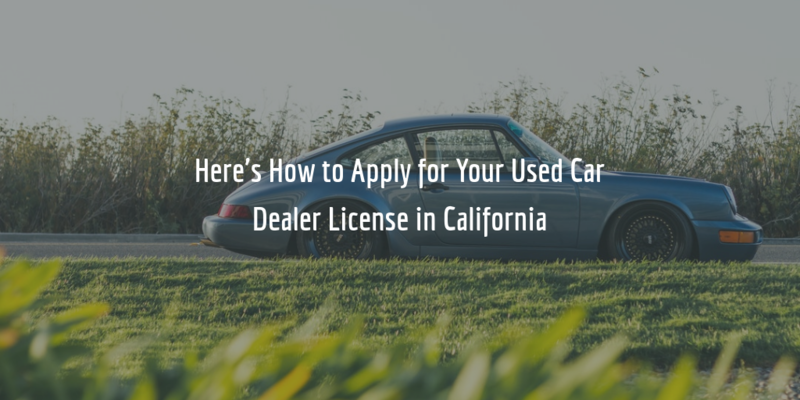 Here’s what you need to know about applying for your California used car dealer license! You can find all forms and documents you must complete for your application at the DMV dealer application requirements website. To get an initial grasp on what is required of you as an applicant, you can consult the Vehicle Dealer Handbook. The handbook contains all the details regarding location requirements, how to complete your application, and where to file it, etc. Prior to setting out to apply for your license, you must, of course, have complied with such requirements. The amount of the surety bond for used car dealers in California is $50,000. The bond amount is not equal to the cost of getting bonded, though! The cost of your bond is equal to a fraction of the whole amount of the bond. When you apply to get bonded the surety will look at your personal credit score, your personal and business financial statements, and possibly at other financial information. Primarily based on your score, the surety will determine your bond premium or rate. The higher your credit score, the lower your rate will be. For example, applicants with a credit score of 700 FICO or more can expect to get a rate on their bond equal to .75%-1.5% of the full amount of their bond. If you are offered a 1% quote, that would mean that you would need to pay $500 for your bond. Want to know how much your bond will cost? Click on the banner below to complete our bond form and get a free and exact quote! Ready to apply for your auto dealer bond? Start with a FREE quote!